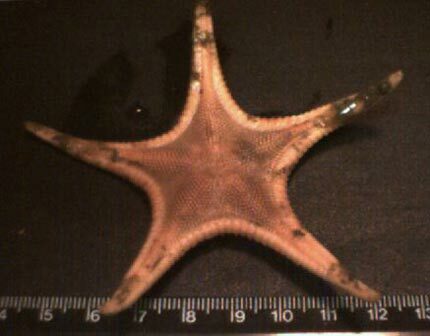 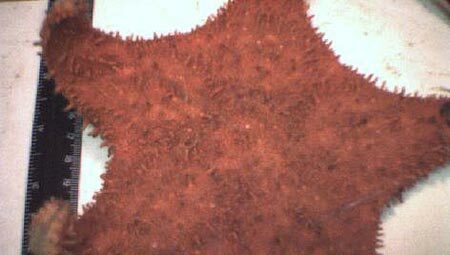 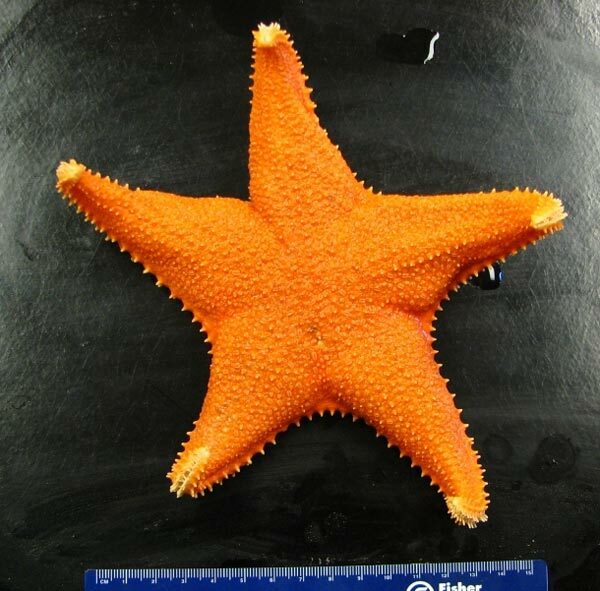 Echinoderms ("spiny skin") are one of the few animal phyla that are totally marine. 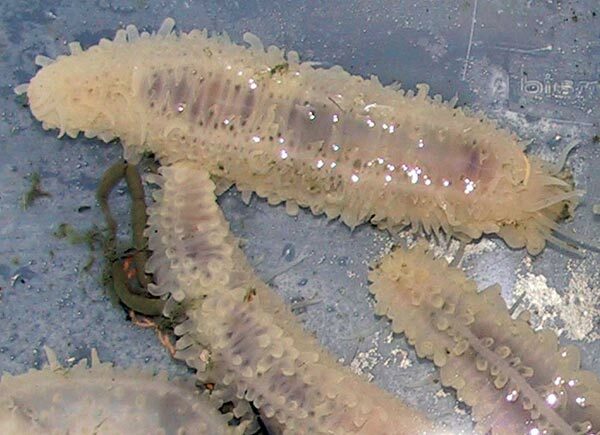 They typically have a unique five-fold symmetry and a unique locomotory system consisting of hundreds of tube feet. 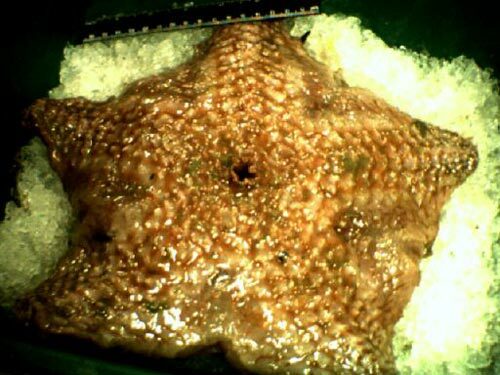 Most groups are quite common in shallow waters, but for unknown reasons, they are extremely successful in the deep. 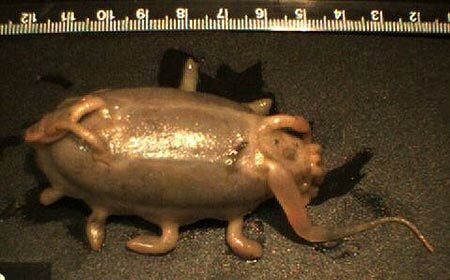 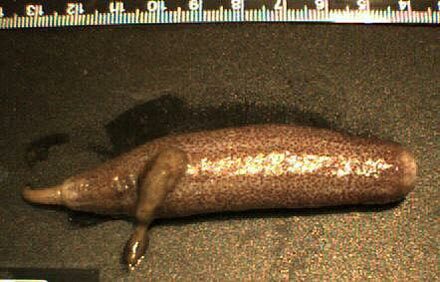 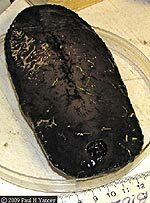 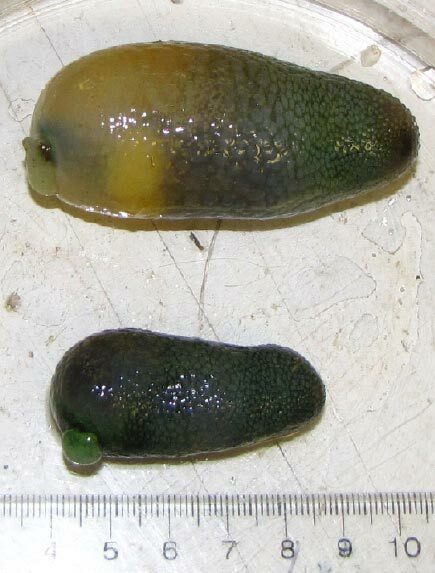 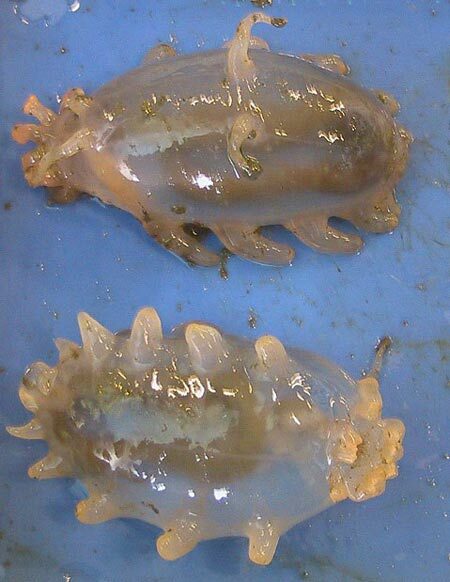 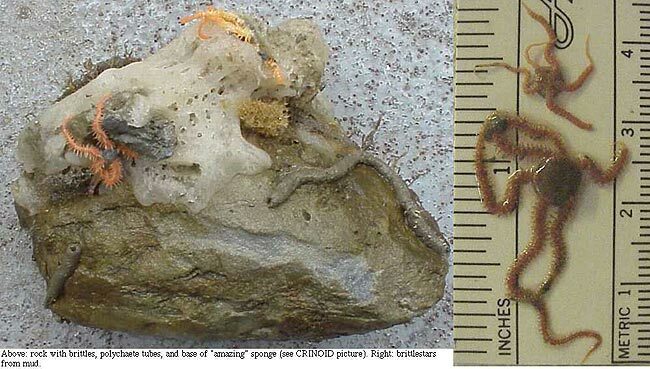 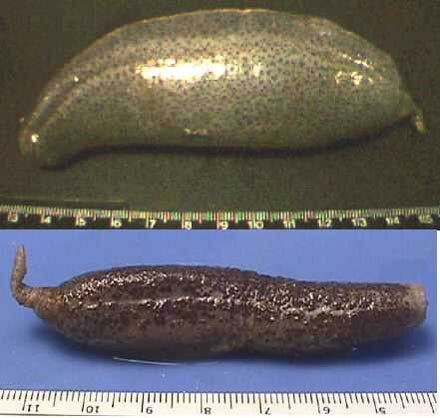 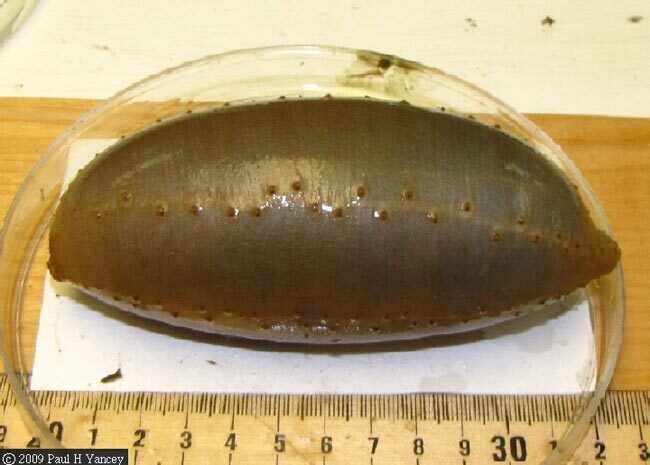 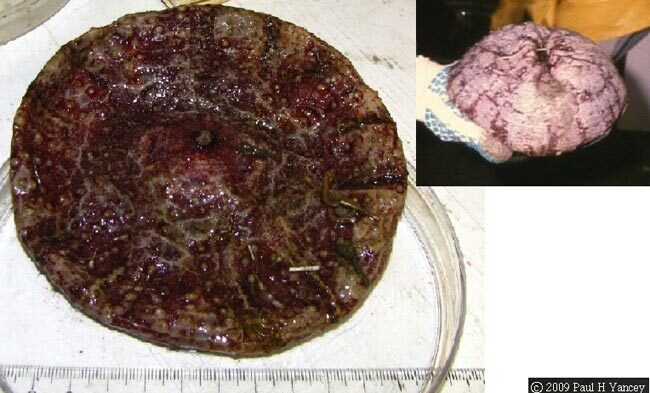 Sea cucumbers (and seapigs --pictures below, and diagrammed above) (Holothuroidea) are often the most common macroscopic animal in deep dredges.The seapig Scotoplanes galatheae has been caught at 10,000m in the Kermadec Trench! 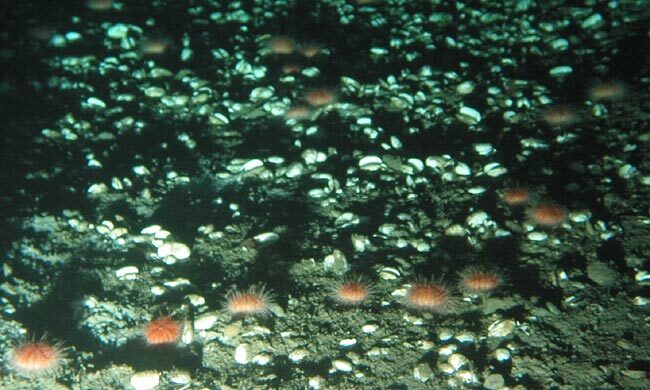 Most plow along like worms and engulf the deepsea mud, digesting organics and bacteria. 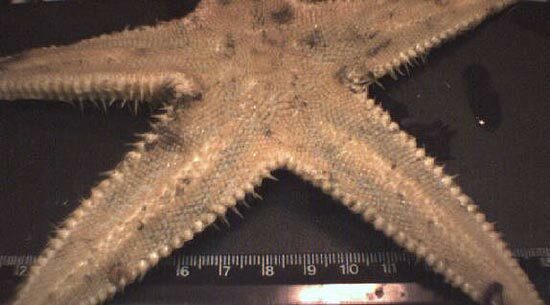 However, there are some species which can swim above the bottom. 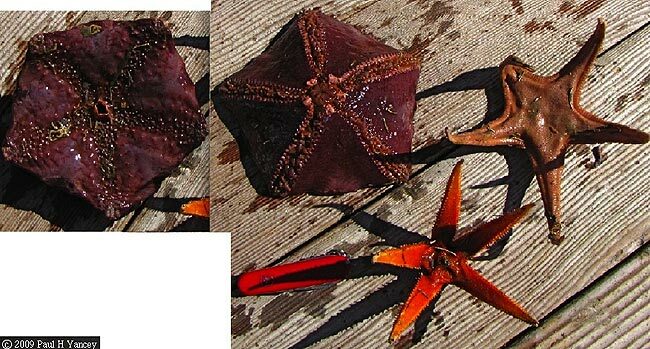 Scotoplanes; Diagram Courtesy of Peter Batson, author of Deep New Zealand - Blue Water, Black Abyss. 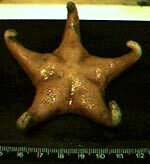 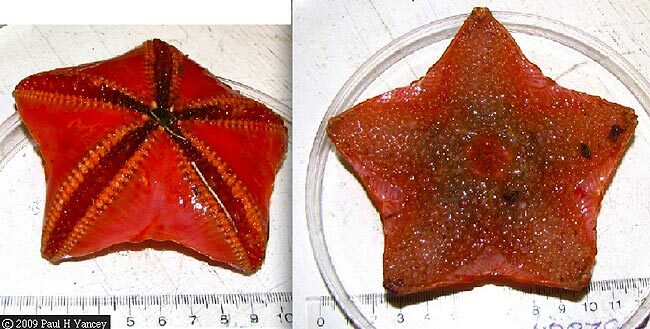 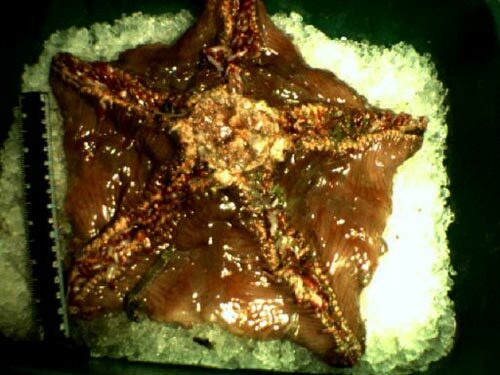 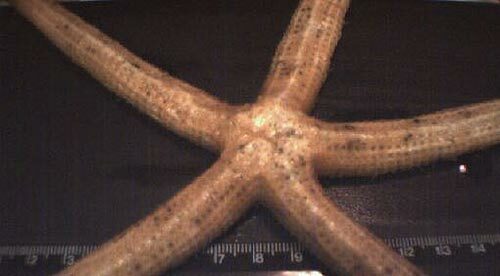 Seastars or Starfish (Asteroidea) creep along with their tube feet and eat live prey and dead remains. 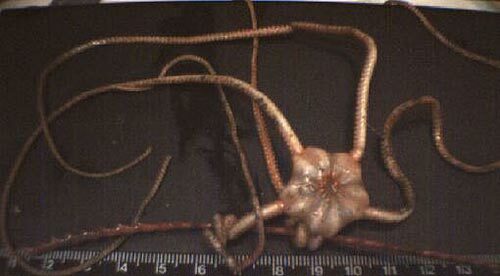 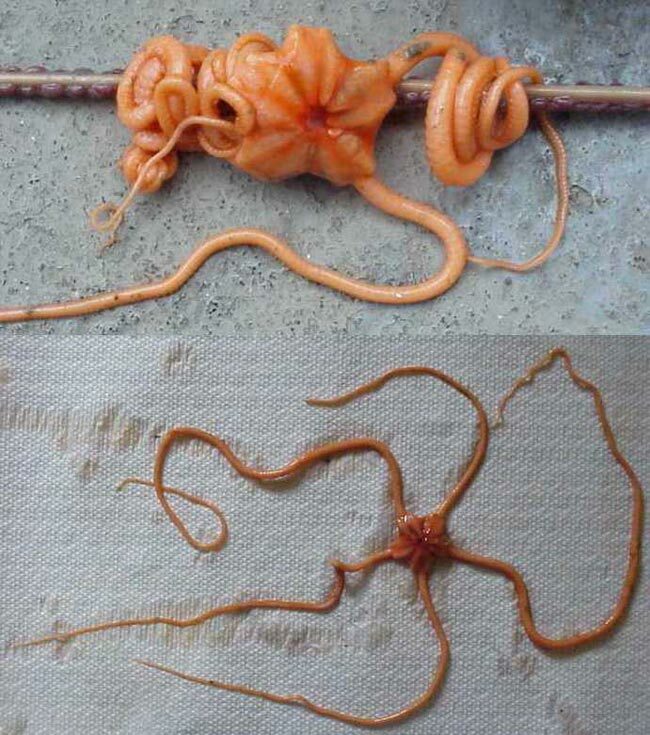 Brittle and basket stars (Ophiuroidea) use their flexible arms rather than tube feet. 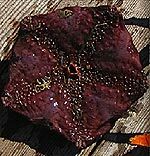 Brittles move through the mud, scooping up organic remains; some brittles and the basket stars catch floating organic particles. 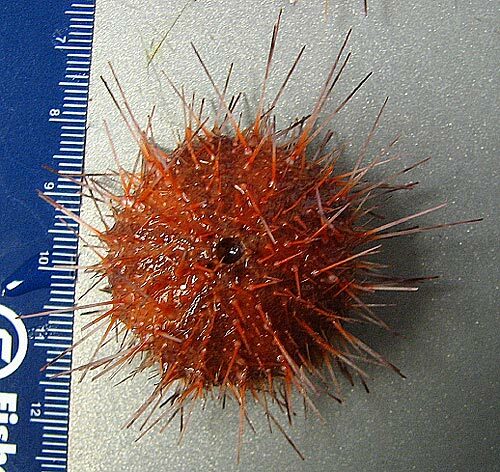 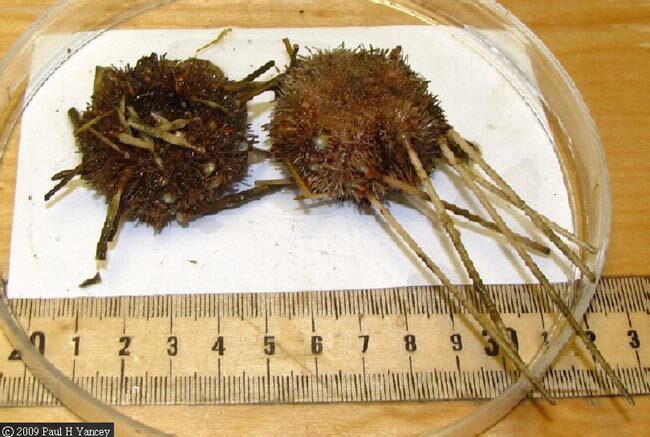 Sea urchins (Echinoidea) are ovoid and covered with spines; they probably eat organic remains. 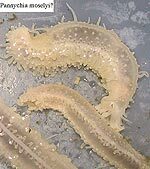 They are usually rigid, but some of the abyssal ones are curiously soft and flexible. 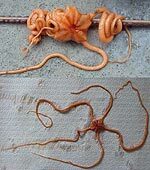 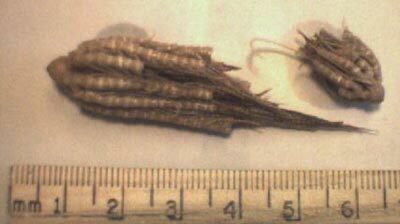 Sea lilies (Crinoidea) are like inverted starfish, with their arms up in the current to catch organic particles. 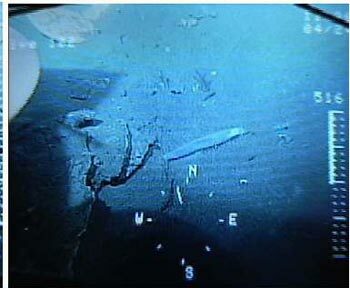 From Eel River seeps off Eureka at 510-525m (er); and Hydrate Ridge off Newport (OR) at 600m (hr). 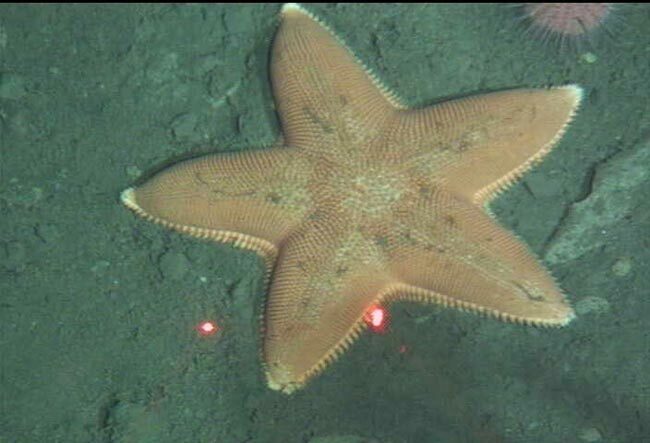 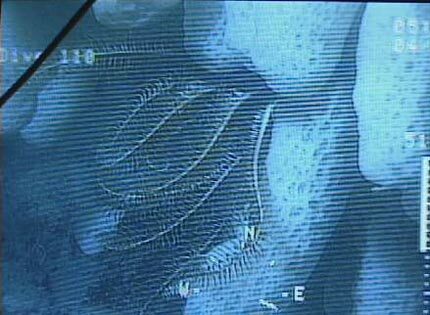 Photos of specimens by me, or taken from ROV monitor and Alvin cameras.